Passions | Keep It Up, David! 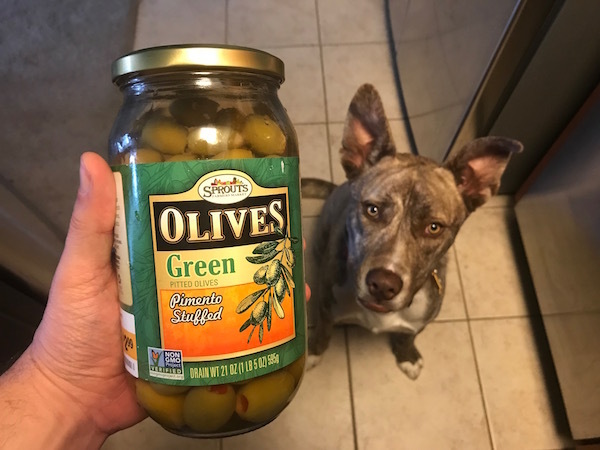 What Am I Going To Do With All These Olives? Sprouts, my favorite supermarket, had huge, 21-ounce jars of green olives on sale for $2.99. Sold! I’m writing this post direct from sunny (and hot) Las Vegas, Nevada! Whew, is it hot! As I write this, it’s 94 degrees and 8:30am. It’s supposed to get up to 104 today! I’m used to heat, living in Los Angeles, but it feels different here. Here, every time I open a door and walk outside, the heat slams into me and for a second it feels like I’m moving slower, moving through jello, until my body adjusts. It’s not stopping me from going outside, that’s for sure, although I have reaffirmed my love of air conditioning. I came to Vegas for a specific event, and I know I promised the other day I’d share what that was, and I will. Soon. I have a full run-down planned. I just need a little more time to process it all. Since I began losing weight, I’ve given a lot more thought to eating while travelling. It’s hard to eat well in general, let alone when you’re removed from your normal setting and your normal routine! There have been trips in the past where, although I didn’t admit it at the time, I was worried about eating smartly while away from home. Last Thanksgiving springs to mind as one of those trips, but I channeled my worrying into creating a game plan to get me through the big meal, made sure I exercised, and ended up losing a pound that week (!). Creating game plans works for me, so, before coming to Las Vegas, I put one together. Vegas is full of temptation, food and otherwise, and I wanted to guarantee some healthy options for myself. The other big thing I to consider was the 4-hour drive from Los Angeles to Las Vegas – that’s a lot of time in the car, and I didn’t want to arrive in Las Vegas ravenous, nor did I want to reply on food I found on the way, because between Los Angeles and Vegas there’s a LOT of desert, and the exits that do have civilization tend to be limited to fast food and gas station mini-marts. So – the question became: What will I eat on my way to Las Vegas, and what will I eat when I’m there? Think… think… think… I know! I’ll bring food with me! That’d be the answer to both questions! Remember on Passions when both Tabitha and Endora had their magic wands (they were witches, after all), and the magical forces streaming from their wands crossed, and it caused the earthquake and tsunami that devastated the whole town and killed Maureen, who asked Sheridan, as she was dying, to raise her son Mark? No? Only me? Apart from 2 lemons and 1/2 a head of garlic, my kitchen is now devoid of produce! Then, on the way out of town, I stopped at Whole Foods. The goal of the stop was to pick up food for lunch (to be eaten in the car) and dinner (to be eaten upon arrival in Vegas). I also decided to buy some food for the next day in Vegas (which would eliminate temptation and save money) – with the idea that when I got to the hotel, I’d clear out the mini-bar in my room and stash the refrigerated items there. Wanna see what I bought? Here’s my haul. Apples and bananas travel so easily, so they were easy choices, and a couple cartons of washed and cut-up fruit (one had melon, the other had strawberries and blueberries). A 1-lb bag of baby carrots, and a big carton of broccoli, carrots, and cauliflower. As soon as I pulled out of the parking lot, I wished I had gotten some celery too, but I didn’t go back. I found this prepared vegan burger and grabbed it for dinner when I got to Vegas. It has 370 cals and 3.5g fat. The patty was good and flavorful and had a nice texture, and the bun was huge. I could have tossed away half of it and saved those calories, but I didn’t. What I didn’t think about was that, once I got to my room, I’d have no way of heating it. So I ate it cold. No big deal. A single serving bag of chip’ins. Sometimes when I eat burgers I crave chips or fries, so I bought these popcorn chips to satisfy that fix for dinner. They’re 120 cals, 2.5g fat, and only 230mg sodium (that’s pretty low for salt in chip-type snacks, isn’t it?). Just Persimmons. These caught my eye and I just had to try. I had bought (and enjoyed) a Persimmons for the first time last fall, and unlike some dried fruit products, this has no added sugar, salt or preservatives. The only ingredient in the bag is persimmons – hence the title! The bag has 4 servings, and each serving is 90 cals with no fat or sodium. I knew I’d have to mindfully eat these – it’s easy for me to overload on dried fruit and consume way more calories that I wanted. Turkey Jerky. This is the in-house Whole Foods brand. Each of the 3 servings in this bag has 60 cals, no fat, and, shockingly for jerky, only 230mg of sodium. Most jerky products on the market have three times more sodium (or more), so whatever it is Whole Foods is doing to cut the salt from the jerky, I hope they keep it up! I bought this as a protein source for Day 2 in Vegas. Soy Jerky. Never seen this before, and was curious! The bag had 3 servings, and each had 45 cals, 1g fat and 125mg sodium. I ate the whole bag in the car, and it wasn’t very good. I wouldn’t buy it again. It tasted like a dehydrated version of seitan, a wheat-based meat-substitute that I’ve bought (and enjoyed) before. I suppose it’s an option for vegetarians craving jerky, but since I eat meat jerky (see previous bullet), I don’t need to buy this again. The plan worked! Lunch, consumed in stages during the drive, was the soy jerky, the cucumber and zucchini, the broccoli and carrots from that veggie carton, an apple, a banana, and about 2 servings of the persimmons. Dinner was the veggie burger, the chip’ins, the cauliflower, and 2/3 of the melon. I ate the final 1/3 of the melon as a snack a little later. That left plenty of food for Day 2 in Vegas. It won’t be enough to make it through the whole day, but it’s a great start. Oh, and part of my plan was thwarted by the absence of a mini-bar in my room. D’oh! But I did have an ice bucket, so I filled that with ice and kept the cooler bag zipped all night. In the morning, the ice was melted but the food was nice and cool. Time to hit the hotel gym! Yep – I was wearing a v-neck t-shirt – how could you tell? Lesson of the day: wear your sunscreen, boys and girls! That photo reminds me of the two blog posts I’ve written about my collarbones (read them here and here) – I love my collarbones, and I went a long long looooong time without ever seeing them! On the plus side, I’m pleasantly surprised by my traps. Which are, of course, the back muscles that extend from the spine to your shoulders and up to your neck. Trap is short for… um… I don’t know. Someone help me out? I’m pleasantly surprised because I’m just starting to notice that I have them, and I happen to think developed traps on a guy is hot. Speaking of Passions, remember when Ethan accidentally slept with Teresa, thinking she was Gwen? Ethan ended up impregnating Teresa, but the thing was, Teresa was already pregnant: she had kidnapped Ethan and Gwen’s surrogate, assumed her identity, and tricked a doctor into implanting Ethan and Gwen’s embryo in her! Which meant Teresa was pregnant with the craziest set of twins ever: one was her and Ethan’s baby, and the other was Gwen and Ethan’s baby. Science, schmience! Damn, that show was good! Anyway, I’m sure Eric Martsolf continues to have fantastic traps – he’s on Days of Our Lives now, which I don’t watch. Oh, and he’s a really nice guy – I met him once. When I volunteered at a Passions fan event. Yep, I was a total Passions nerd! Okay – the soap hunk tangent is over. Let’s get back on track, David! I look at these photos and think, ‘Man, do I need a haircut!’ There’s an appointment on the books for next week. I should have shaved yesterday, too… oh well. After the beach-walkin’, and the pier-walkin’, we walked up and down Seal Beach’s Main Street, which has lots of cute little shops and restaurants, and then we walked through an adjacent neighborhood of gorgeous, big beachfront homes. In total, we walked around for probably 2 hours or so. We worked up a nice appetite, too, and guess where we ended up? I was tempted to pick up a few things, but I didn’t want to lug anything home with me for an hour on the train. So, instead, Karen and I just got lunch. Wanna guess what’s in the take-out container? SALAD BAR is in the take-out container! This Whole Foods has a Wednesday salad bar special – it’s $5.99 a pound, $2 cheaper than the other days. I wonder if all Whole Foods do that, or if it’s special for the Long Beach location? I loaded up on: arugula, chard, kale, cucumber, tomatoes, scallions, red pepper, artichoke hearts, pepperoncinis, kidney beans, tuna, carrots, sunflower seeds, a little scoop of a rice/kamut blend, blueberries, and blackberries. And some apple cider vinegar. It hit the spot. I wolfed it down – Karen even commented on how fast I eat – but I was hungry! I got home in the late afternoon, took a little nappy-nap, noticed my horrible sun-burn, and then, after some dinner (veggie burger, English muffin, condiments, veggies, fruit), it was off to the gym for some fun with weights.